In Architecture, Structures Built For Decoration But Suggestive Of A Functional And Grander Purpose Are Called? Who Created The Ubiquitous :-) Emoticon? Around the world, you will occasionally come across a structure that appears to be a grand and mighty structure intended for some higher purpose, but upon closer examination, it is revealed that the structure, despite its large size and appearance, is merely a decoration. These structures (most being built in Western Europe in the 18th century) have the appearance of medieval-style watch towers, classic Greek and Roman temples, castles, fake ruins of anything ancient, country homes, manors, and more. 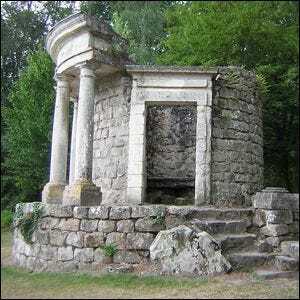 These structures, called follies, were particularly popular during the Regency and Victorian eras among British and French aristocrats and nobility. No expense was spared in the creation of elaborate stone structures on the grandest of estates, and even the less moneyed would often find space in their gardens for modest faux-ruins to lend an air of ancient mystery to their property. Although the inspiration for such works is a matter of debate, most scholars agree that the wealthy in places like England, France, and neighboring countries were inspired by ruins of monastic houses and other structures on estates in the region as well as the ruins of Roman villas in Italy. The eras from which these old structures came were heavily romanticized and those without such structures on their property commissioned artists to build them.